Phytophthora nicotianae Breda de Haan (= Phytophthora parasitica Dastur) has a long history as a pathogen of plants. It was first described in 1896, and has a broad host range (Erwin and Ribeiro 1996). In black wattle (Acacia mearnsii De Wild. 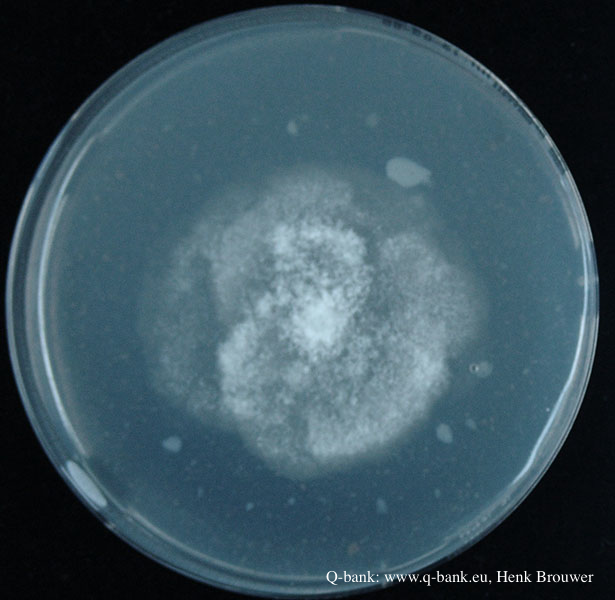 ), it causes a disease called gummosis. It was reported in 1971 in South Africa (Zeiljemaker 1971) and in 2005 in Brazil (Santos et al. (2005). In Brazil, gummosis of black wattle is also caused by P. boehmeriae Sawada (Santos et al., 2006) and P. frigida Maseko, Coutinho & Wingfield (Alves at al., 2016). In South Africa, other agents are P. boehmeriae and P. meadii McRae (Roux and Wingfield, 1997). Gummosis disease is characterized by necrotic bark lesions of varying sizes, with or without exudation of gum. Lesions are located in the collar and in the basal region of the trunk (Santos et al., 2001). In Brazil, evaluation of commercial plantations showed the incidence of gummosis to be over 20% (Santos and Luz, 2007). Sporangia formed in 10% nonsterile soil extract are papillate, persistent, and predominately ovoid, measuring 56.0 x 35.0 to 33.3 x 24.5 μm (average: 42 x 29 μm) with a length-breadth ratio of 1.4:1. 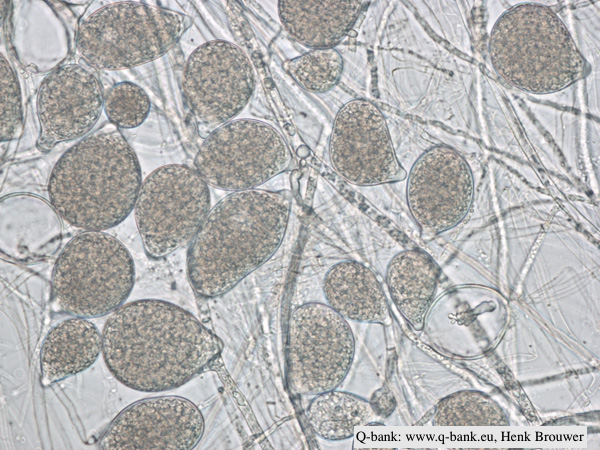 Chlamydospores are terminal or intercalary in the mycelium, with a diameter of 25.4 to 40.3 μm (average of 33.0 μm). P. nicotianae is heterothallic and isolates from both the A1 and A2 compatibility groups are recovered. 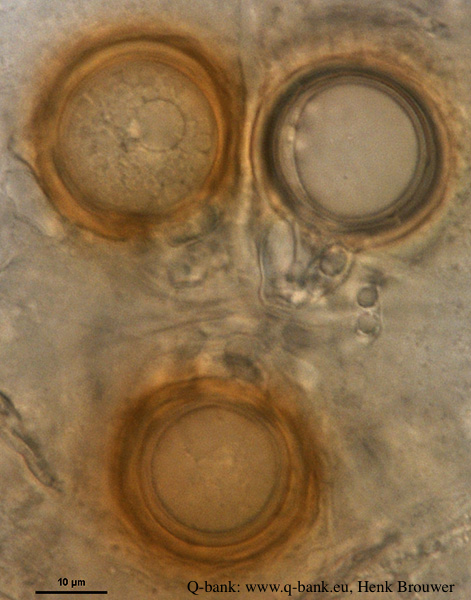 Oospores measure 23-38 μm in diameter (average: 29 μm). The antheridia are amphygynous (Santos et al., 2005). Left: Globose chlamydospore (Fitopatol. bras. 2005). Right: Oogonia. Photo from Q-bank: www.q-bank.eu, Henk Brouwer (CBS-KNAW, Utrecht, The Netherlands). 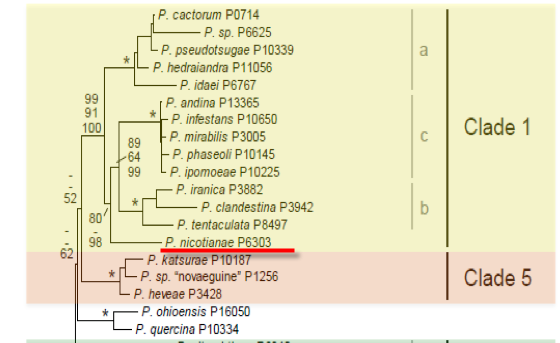 Phytophthora nicotianae is placed in Clade 1 (Kroon et al., 2012). 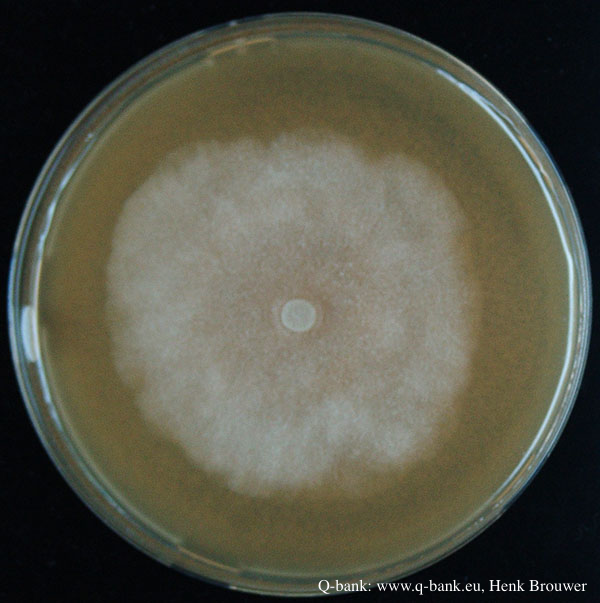 Cultures of P. nicotianae on carrot agar medium (CA) are petaloid, with dense and cottony aerial mycelium; colonies have diffuse edges. The optimum temperature for mycelial growth is between 24 and 32°C, and no growth occurs at 36°C (Santos et al., 2005). 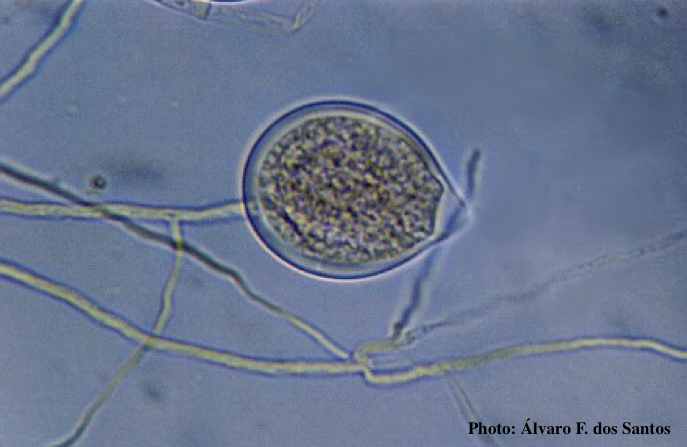 P. nicotianae is similar to P. frigida in various morphological characteristics, including persistent, papillate and ovoid sporangia, amphigynous antheridia, and heterothallism. Isolates of both species do not sporulate on solid media (Santos et al. 2005, Alves et al. 2016). However, they can be separated by molecular analysis, as P. frigida is in Clade 2 and P. nicotianae is in Clade 1 (Kroon et al. 2012). P. nicotianae can be differentiated morphologically from P. boehmeriae and P. meadii. 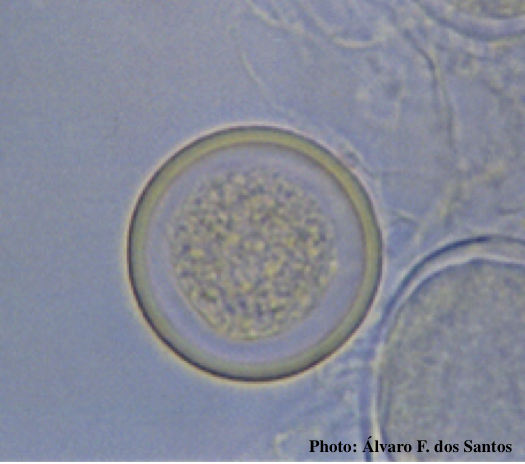 P. boehmeriae is homothallic, produces caducous sporangia with short pedicels (<5 μm), and does not grow at 32°C (Santos et al., 2006). P. meadii also produces deciduous sporangia, on medium-length pedicels (18 μm) (Gallegly and Hong 2008). For more information about Phytophthora nicotianae, visit our Disease, Education and Management materials, and Reference sections.